Volkswagen e-Golf long-term test review | What Car? That’s because I’ve taken delivery of a brand new e-Golf – Volkswagen’s second electric vehicle, which arrived a few months after the much smaller, shorter-ranged e-Up. Officially, the range is 186 miles, but VW reckons that this translates to around 124 miles in the real world. Why me? Well, not being fond of paying a small lottery win each month in return for a bed and not much else, I live around 62 miles away from the What Car? offices, in Southampton. That makes a daily round trip of 124 miles. I think you can see where this is going. Electric vehicles (EVs) are something of a rolling contradiction. They’re a huge topic in the car industry, with every major manufacturer planning an 'assault' on the market or already in the throes of one. Despite this, EVs still only make up a tiny fraction of the overall market, with fewer than 1000 finding homes among 168,000 total UK registrations in April. My commute is atypical for an electric car owner, admittedly. Most people’s daily miles are less than half of what I do and, even then, the vast majority choose to cover those miles in a petrol or diesel-engined car. It’s my job to discover how a daily Southampton to Twickenham round trip, as well as all the other miles of a socially active twenty something, differ on electric power. So what do we have? My travel companion for the coming months is fitted with a few extras, namely the economy-boosting heat pump, heated windscreen, washer jet and front seats in the form of the Winter Pack, the much-lauded digital dashboard (Active Info Display), keyless entry and start, plus some floor mats. Our Atlantic Blue metallic paint is a £575 extra, bringing the total cost of our car to £35,490, or just under £31,000 including the Government’s £4500 plug-in car incentive. In terms of first impressions, let’s roll out the soundbites early: eerily quiet, heavier-feeling than petrol equivalents, but with punchy acceleration and a range of about half of what you’d usually have in a petrol car. I could tell you all that without even stepping inside the car, because I could be talking about most electric cars. On to the bits that matter, then. 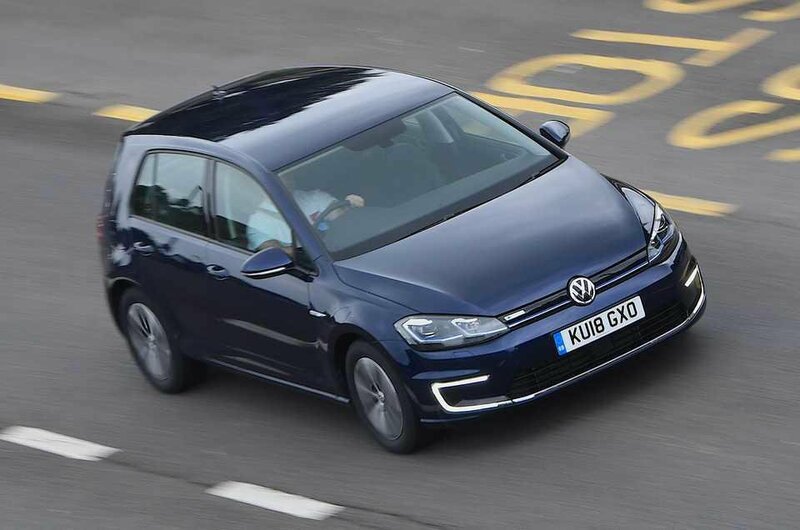 Unless you know what to look for, the e-Golf is all but indistinguishable from the standard Golf; no aerodynamic-friendly wacky styling, no virtuous 'I’m saving the planet' name, just the same handsome Golf we know and recommend, prefixed with an ‘e‘. The same goes for the inside – the untrained eye couldn’t tell it apart from a petrol or diesel variant. Running costs aren’t zero, obviously; the e-Golf costs around £4 to fully charge from home. From a three-pin plug and from almost empty, it takes around 14 hours to charge to full, but from a 7kWh home charger, it’s nearer a third of that. Being an EV newbie, range anxiety is inevitable. I have the luxury of charging both at home and at work, so seldom approach the limit of the battery. 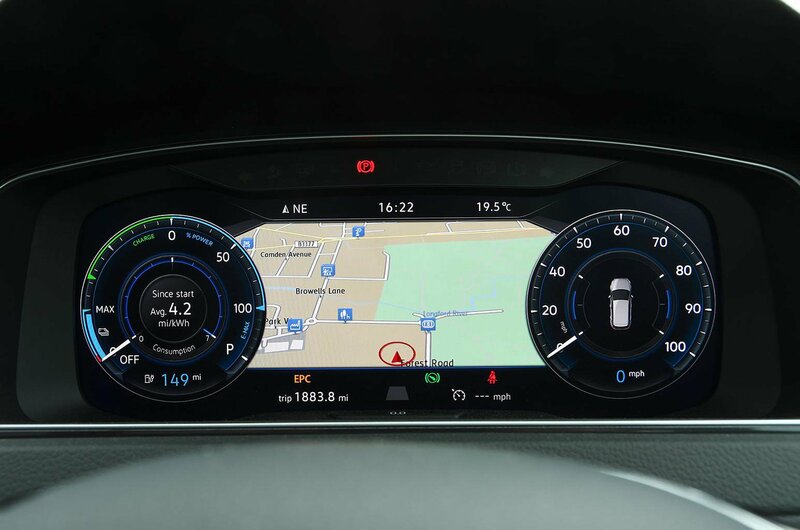 The first time I did, there was plenty of warning to let me know that the car was getting hungry; first when the range indicator read 30 miles, then at around 20 miles, and finally at about 10 miles. Each warning was accompanied by a greater level of energy austerity than the last, with the first mildly limiting performance and comfort features, the second restricting them and the third basically strangling them. My 24-mile round trip one evening with 33 miles of indicated range was a little ambitious, admittedly, and by the third warning I had sweaty palms and was already thinking of who to sheepishly call when I ran out of juice. Thankfully, it wasn’t needed, but I did feel like I was getting told off by the car’s increasingly stern warnings and limits. 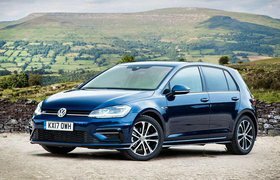 Recklessness aside, VW’s estimation of around 124 miles of real-world range is bang on; traffic depending, I reckon the car could make it back home on the same charge that it made to the office with – having charged up in-between trips – although traffic makes a considerable difference to the car’s performance. Unusually, the e-Golf seems to last longer if you’re moving slower in heavy traffic; the opposite of what you’d expect from a petrol or diesel car. So the completely different yet business-as-usual e-Golf has already begun with some surprises. Roll on the next few months, for better or for worse.